There are at least 30 varieties of apple which come from Sussex, and many of these can be found planted in Home Farm Orchard. The trees form part of the National Collection of apple varieties from Sussex at Stanmer Park. 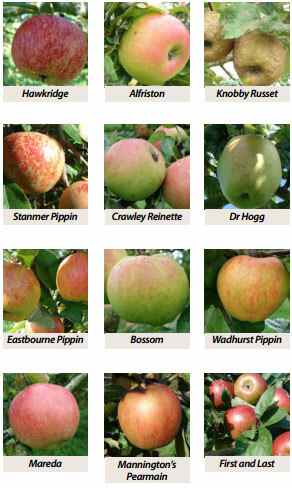 The apples of Sussex varieties vary in colour and size, from the dark reds and green of First and Lastto the pale yellow of Eastbourne Pippin. There is also a lot of variation in the month in which they ripen. The vivid red Ashdown Seedling is ready to be picked in mid August, while Saltcote Pippin is an October apple. Some of the varieties like Crawley Beauty and Mareda can be stored until after Christmas. For more information, you can see our Sussex apple directory online or view/download view/download “A Guide to Sussex Apple Varieties,” excerpted from Apples & Orchards in Sussex by Brian Short, Peter May, Gail Vines and Anne-Marie Bur (Action in Rural Sussex and Brighton Permaculture Trust: 2012). As you walk into the orchard, you can see many of the Sussex varieties on your right, trained as cordons against wires. 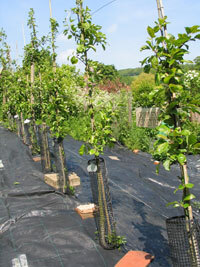 This is a useful method of growing apple trees where space is limited. There are also bush apple trees planted in the orchard, and by the hedge you can find Sussex varieties which will grow to large standard trees. Each of the Sussex varieties can be identified by a label with the variety name in red. Until a few years ago, many of the Sussex varieties were very rare, so part of the work of Brighton Permaculture Trust and other organisations has been to propagate them and plant them out in school and community sites in the county. This will ensure their future and allow them to be more widely known and appreciated. Brighton Permaculture Trust has also been monitoring the trees to discover which varieties grow well under organic conditions. Many of the names of the apples link them to a particular place. Hawkridge, a sweet apple with red and crimson stripes, comes from Hawkridge Farm near Hellingly, while Wadhurst Pippin grows in the heavy clay soils of that area. Some names, however, can be misleading. Alfriston, a brisk cooking apple, was raised during the late 18th century in Uckfield as Shepherd’s Pippin but was renamedAlfriston by a Mr Booker, who lived in the village. Other varieties have descriptive names or are named after well-known apple experts. The underlying russet skin of the curious Knobby Russet is often covered in knobs, warts and bumps. Tinsley Quince is an apple, not a quince, but its name describes the slight quince-like smell that develops as the fruit ripens. Dr Hogg, a large ribbed cooking apple was named in honour of Robert Hogg, who worked to clarify and rationalise the identity of the many different apple varieties grown in England in the 1870s. Other varieties have historical associations. The large, handsome, red-streaked Coronation celebrates the coronation of Edward VII in 1902, while the name Forgereflects the presence of old iron workings in the area where the tree was commonly grown, near East Grinstead. The Sussex variety with the longest history in cultivation is Golden Pippin,which has been grown since at least 1629. It is claimed that it arose at Parham Park, but its origin seems uncertain. It is also the smallest Sussex apple variety. With its lemony tang, it was poached whole or used to make sweetmeats, jelly, tarts and cider. Why not plant one of these wonderful varieties in your garden, school grounds or community garden? One characteristic of the Sussex varieties is that many of them grow well in the local climate and soil conditions of the county, whereas the apples found in shops are often difficult to grow and will struggle to produce a healthy crop of fruit. 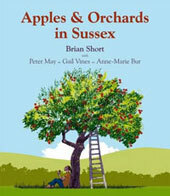 Many of them are available from Peter May: sussexappletrees.co.uk from November to February.